There's no disputing that Europeans love their wine, but not every country is guzzling wine at work, in the bathtub, and while sleeping like those crazy French people. A map created by Czech linguist, mathematician, and artist Jakob Marian breaks down just how much wine each European country is drinking (in liters per year per capita). Surprisingly, France does not come in at no. 1. 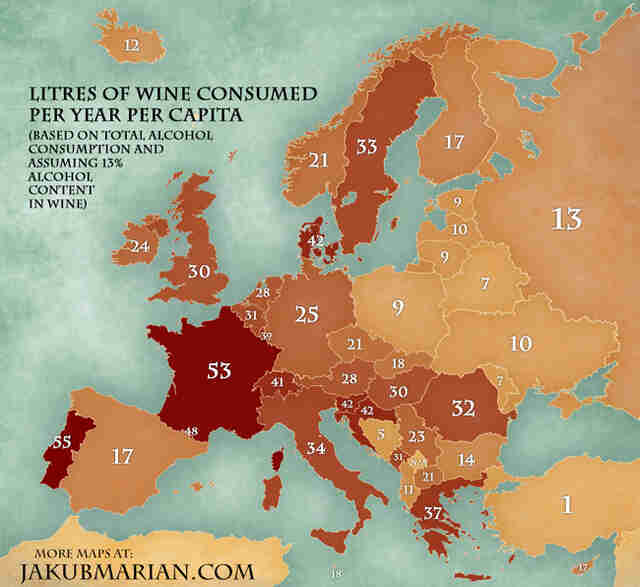 Portugal is actually the biggest wine consumer in Europe, coming in at 55 liters per year per capita -- with France just behind it; Slovenia, Croatia, and Denmark follow (all tied), then Greece, and Italy. Who's skimping on the wine? Turkey -- the country consumes just 1 liter per year per capita, followed by Bosnia-Herzegovina, Belarus, and Poland. 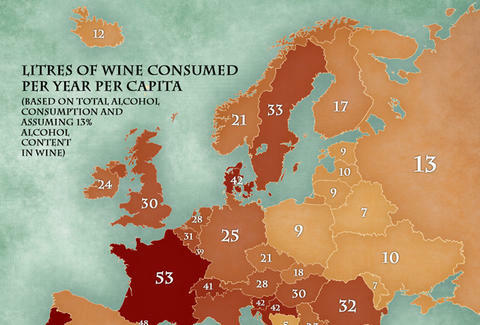 Overall, Eastern Europe is chugging far more beers than wine.